The international lighting exhibition Euroluce showcases the most innovative solutions in the world of lighting design. With over 480 of the top exhibitors from around the world, Euroluce is the global industry’s definitive event. At this year’s special 30th anniversary edition, BROKIS is presenting its collections in an expansive 200 m2 stand with a singular conception of the lighting installation and the space itself called BROKIS IN A NEW LIGHT. Visit BROKIS at stand D15 in hall no. 13. 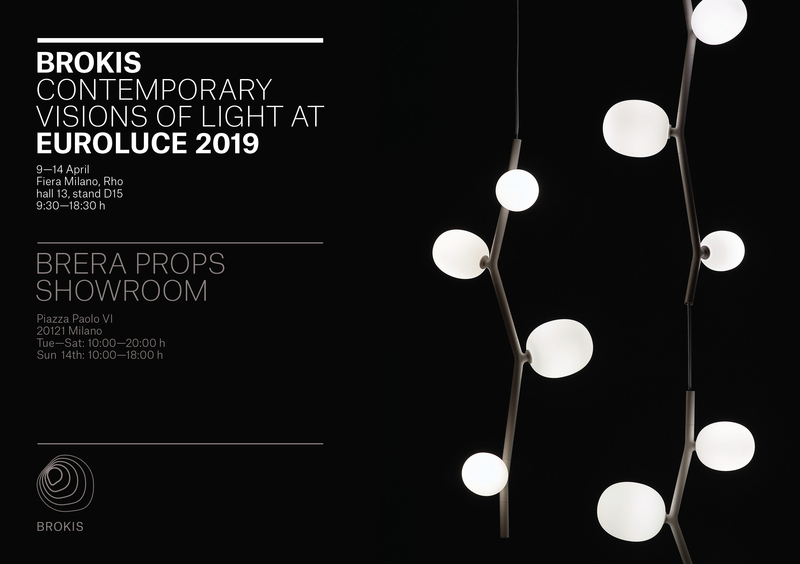 You can find more information, a clear summary of all our new products on the special website euroluce.brokis.cz devoted specially to EUROLUCE 2019. We trust that you’ll like the new website and that it will become your online guide. SHOWROOM BRERA PROPS With the Brera Props showroom, BROKIS offers a so-called inspiration space intended for clients who want to take a break from the bustle of Euroluce and enjoy the ambience of our products in a different light.